Although numbers were moderate in the Bull Show, judge Ebling was impressed with the quality. The Grand Champion Percentage Simmental Bull title went to Griswold & Circle M of Rockwall, Texas, and the Reserve Champion Percentage Simmental Bull honor went to Trennepohl Farms & Lawson Farms of Middletown, Indiana. Closing out the bull show, Circle M/Harker/Silver Towne/Hudson Pines of Rockwall, Texas, was deemed Grand Champion Purebred Simmental Bull and Shoal Creek Land & Cattle was chosen as Reserve Champion Purebred Simmental Bull. The Simmental Show resumed this morning on the east side of Hale Arena. Chesney Effling of Highmore, South Dakota, was named Grand Champion Junior Percentage Simmental Heifer under judge Harlan Yocham of Saulpa, Oklahoma, and Becca Chamberlin was selected Reserve Champion Junior Percentage Simmental Heifer. 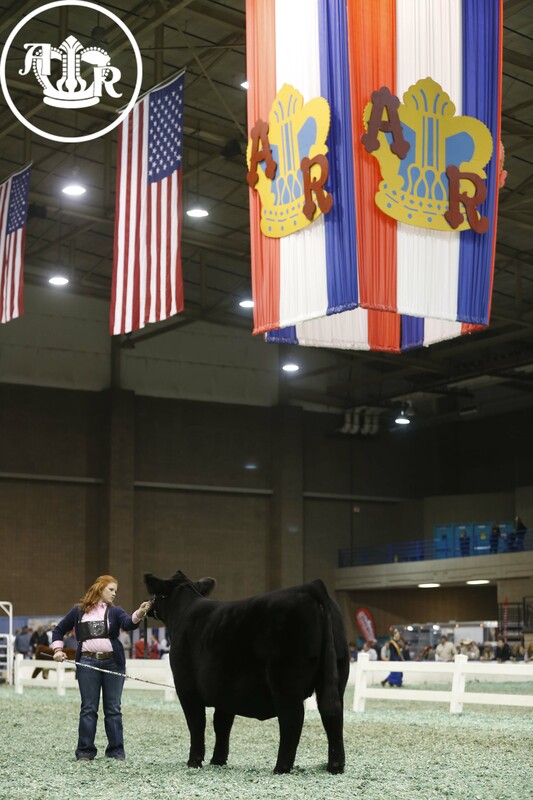 Yocham then went on to name Miranda Raithel of Falls City, Nebraska, as Grand Champion Junior Purebred Simmental Heifer and Cole Reiboldt of West College Corner, Indiana, as Reserve Champion Junior Purebred Simmental Heifer. Following the Junior Show, Mark Ebling evaluated the Simmental PTP Show. Taylor Goering of McPherson, Kansas, took home the title of Grand Champion Percentage Simmental Heifer with Grace Greiman of Goodell, Iowa, selected as Reserve Champion Percentage Simmental Heifer. Closing out the show, Ebling chose Jake Bloomberg & Griswold Cattle of Stillwater, Oklahoma, as Grand Champion Purebred Simmental Heifer and Carli Henderson of Wiota, Iowa, as Reserve Champion Purebred Heifer.